Well the back yard comes to mind again. Al’s moves caught on. Of course, I really wanted to put YMCA, but it would have to be the synchronized swimming version. sigh. We call it the anthem. It was on one of Jerry’s mix tapes and that tape made its way to a party in “Rock Holly”. I’m pretty sure Ernie was involved in its elevation to sacred. This song is played at all major family events. If you’re new to the family, your acceptance is gauged by how soon you join in and how loud you sing the refrain. We have fun with music and family and friends. We have a pretty cool backyard and lots of folks like to hang there. It took me a while to realize why this song haunted me for so long. Yeah, it sums it up real good! What are you looking forward to, for better or worse? Remember that song by Carly Simon? Anticipation? The ketchup ad? I found this on YouTube the other day. It’s a wonderful take on the old song. Carly’s children, Ben and Sally, sing and play with her. Listen to the whole tune if you have the time. Come back later and enjoy it again. It’s just that good. I love that James and Carly perform with their children. I love the mix of music and family. It’s one of my core values! I’m blessed to belong to a family of very talented musicians, artists, gardeners and writers. Music is something we all enjoy and appreciate. I love good music. I love tight harmonies. I love live music and acoustic music. I guess this is why I last weekend was so wonderful. 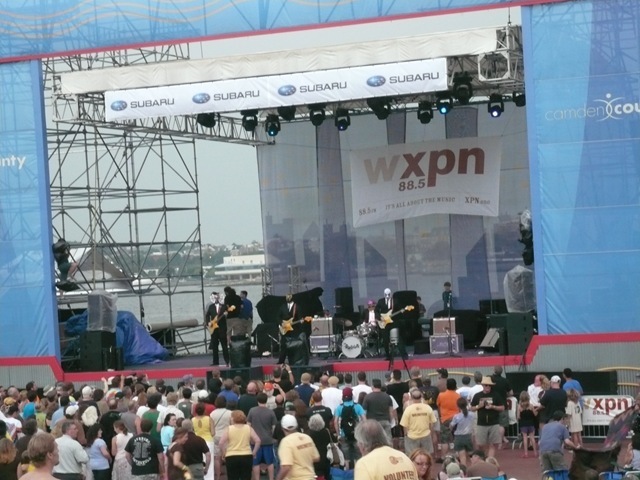 The University of Pennsylvania radio station, WXPN-FM, hosts a live music event every year. It has become the highlight of my summer. It starts on a Friday night at 5:00 PM and goes until 9:00 PM or so on Sunday evening – more than 25 hours of great, live music. You can bring in coolers with food and non-alcoholic beverages although you can purchase all kinds of food and beverages, as well as craft items and clothing. The cost for this festival – $30, if you’re a member of the radio station. 30 bucks for 3 days of the best live music you’ll ever hear in one weekend! And the best thing about the weekend is that because it’s so affordable, you can go with family and friends and share the experience of hearing old favorites and finding new favorites. Rehearsals began at the end of June. This was the first blocking rehearsal for this scene and the quality isn’t great because I used my Crackberry. I can’t wait until we open in September. It will be fun to go back and compare this scene to the final product! I am really blessed to be able to do so many things that I enjoy. I’m praying that I never get so old or grumpy that these joys become a burden. Shows are a lot of work and a huge time commitment. The relationships that are formed make the teamwork and creativity that are required easier to handle. Many times over the course of the last few weeks, I’ve regretted having to leave my family and friends to go to a rehearsal. I haven’t been down the shore once this summer. I’m not sure if I’ll have an opportunity to get down there between rehearsal schedules for two shows, a wedding and my full-time job (even though we’re on summer hours right now). Still, I’m looking forward to the next few months. I’ll post updates as we make progress.